What does it take for a $260-billion multinational corporation like Exxon to catch a break these days? Of late, Exxon has been buffeted by climate lawsuits filed by cities and states, among them the attorneys general of California, Massachusetts, New York and the U.S. Virgin Islands. Even former employees are suing the oil behemoth. The lawsuits against the company argue it should be held liable for damages from climate change because its products are behind our rapidly shifting atmosphere. They also argue that Exxon knew the oil it was selling is one of the root causes of climate change, yet it engaged in suppressing its own research and sowing doubt in what looks like an actual conspiracy. All of this has been meticulously documented by the media and researchers under the #ExxonKnew banner. The petition alleges that the conspirators are trying to curtail Exxon’s First Amendment rights and ability to participate in “the marketplace of ideas,” and abusing law enforcement powers. Exxon has even come up with a name for the conspiracy: “The La Jolla playbook,” named after a June 2012 workshop that saw about two dozen scientists, historians, and lawyers meet to discuss lessons from the fight against major tobacco companies. Earther has obtained a copy of this devious playbook through this *squints* publicly available report that Exxon cites in its first footnote. The conspiracy part comes in because some of those at the workshop have since provided advice or helped with the current crop of lawsuits against Exxon and other oil giants. 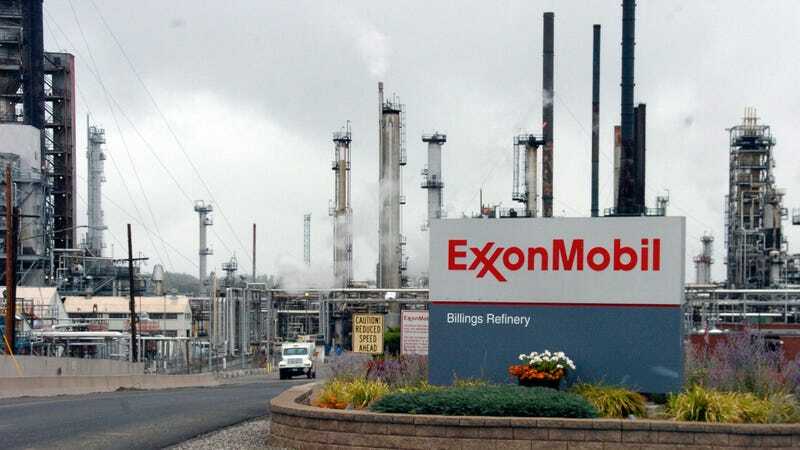 In order to get to the bottom of this mystery, Exxon’s new suit says the company would like to depose 16 people who were at the La Jolla workshop or are involved in current lawsuits against Exxon. Bloomberg reports that the company has targeted at least 30 people or organizations in total who are involved with lawsuits against it. All this is to say that Exxon, which has used some of almost the exact tactics as tobacco companies to obfuscate the link between smoking and cancer, is upset it now faces lawsuits that rely on strategies used to pursue the tobacco industry. If this sounds like a way to intimidate people working on the various cases and anyone else who may want to get involved, well, that appears to kinda be what this is all about. Legal experts have said they see nothing wrong “with plaintiffs’ lawyers and attorneys general strategizing together” and that the petition “would be laughable” if Exxon weren’t a huge company. The petition dropped the month before Exxon CEO Darren Woods espoused that Exxon is taking climate change very seriously and remains committed to the Paris Agreement as well as putting a price on carbon. And while the company has certainly made strides publicly to be more climate-friendly, it is still, well, an oil company. It also doesn’t erase decades of sowing doubt that are at the center of the lawsuits its facing. While Exxon may be trying to play up its victimhood with the petition and a fresh, new face in public, it’s an incredibly tall hill its going to have to climb.